Each year LAU, together with the Ministry of Social Affairs, presents an NGO fair for students at the university, with the aim of instilling in students the importance of community service and volunteer work. By bridging the gap between students and civil society, the fair presents NGOs with a platform to educate students about their work, and students are given the opportunity to channel their creative potential, energy and passion into the meaningful conduits of constructive social work. Last year, the LAU NGO Fair hosted 70 NGOs from across Lebanon. 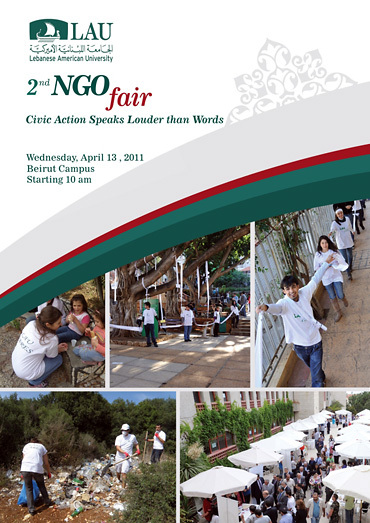 Due to its wide success, this year LAU’s Outreach and Civic Engagement Unit will gather 100 NGOs on campus. This year, the NGO fair’s theme is “Civic Actions Speak Louder than Words.” This year, the fair will include screenings of documentaries that have been made by the NGOs. Check the schedule of the screenings as well as the synopses of all the documentaries. To find out more about the event, please contact: sarah.bouajram@lau.edu.lb.